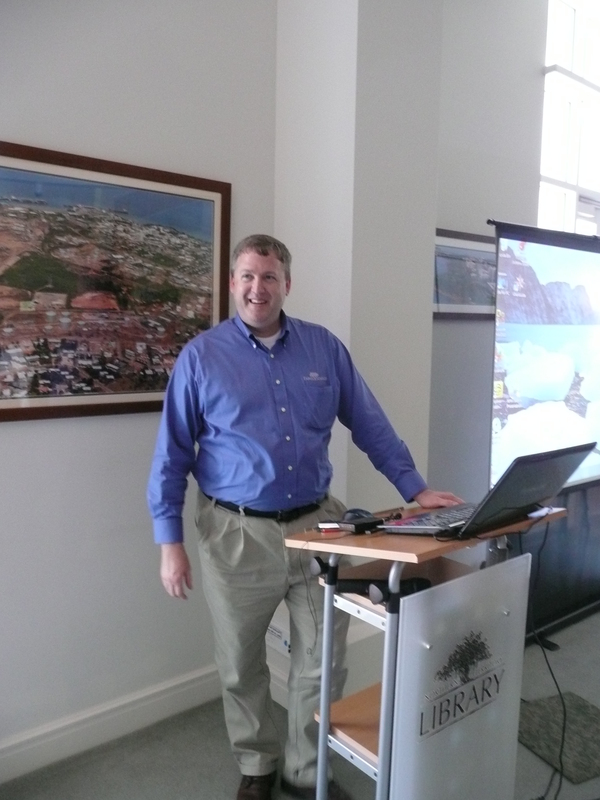 Dan Poffenberger seemed to enjoy his time presenting in the Northern Territory Library. We’ve had an unusually good run of family history experts here in Darwin this year. Last Saturday we were lucky enough to have preview presentations by two of the speakers, Dan Poffenberger and Todd Knowles who were en route to the AFFHO Congress 2012. Both were amusing, engaging and knowledgeable presenters who work at the Family History Centre at Salt Lake City and both have wide experience in their subjects. They were welcomed by about 50 or so family history researchers who seemed to thoroughly enjoy learning from Todd and Dan’s experience. Dan kicked off the day with a joke about his son and their surname, but I won’t give it away in case he’s using it in Adelaide. He spoke to us about five critical elements of the new Family Search: Records, Trees, Books (digital), Learning Resources (Wiki) and Classes and Forums. While none of these elements were news to me, it did remind me I need to schedule time to look at some of the videos by professionals on particular topics. Dan also talked about the contribution by volunteers to the wiki and the indexing projects which has spurred me on to lift my game with indexing. I’ve used the wikis already in my research but there’s obviously far more that I need to look at. Some of these which Dan mentioned were English probate info by parish and Chancery Court and Equity pleadings. Dan highlighted the need to selectively choose your search parameters when using Family Search through the advanced search option – his motto “you set the parameters not the computer”. He also emphasised that the LDS Church has a program to digitise its current holdings of microfilmed records in what will be a comparatively short time line given the sheer volume. Of course anyone who followed Roots Tech will have known about this huge digitisation project. He did warn us that they will not get permission to digitise certain records because this option wasn’t envisaged when they first got authority to film them. One bit of news which stood out for me was that there are now 33 million Dutch records digitised online at Family Search. Dan didn’t think this was particularly important to Australian research but I grew up in a parish which had a huge post-war Dutch migrant population. So for all of them, this will be a massive advantage. Another item of relevance is Dan’s emphasis on Family Search being “good neighbours in the family history community”. This is why you’ll see some digitised records are free and others might refer you to a paid site which first did the digitisation. Do keep a look out for the digital option on the search results page. Dan also suggested that the forums provide a great way for getting expert assistance with your problems eg getting a translation of old German script. Todd Knowles empathised with all of us with Irish ancestry and how Irish research throws up brick walls and can drive us nuts. However he suggested that not all is lost and there are options out there to help sort out our Irish families. I disagree with his hypothesis that most people start out knowing their ancestors’ townland. Even in the Australian context, where we were can often learn our ancestors’ place of origin from the shipping records, the townland is often unknown in the beginning. I personally think it’s more likely we know a county or town rather than townland. I agree with him that knowing the parish is so important. (As a sideline, any new researchers might be interested in posts from Findmypast Ireland, here and here, about the responsibilities and definitions of Irish administrative areas such as these). Todd shared just how many resources are actually online to help us out: Irish Origins, Roots Ireland, Irish Genealogy, Irish Ancestors, and others. I did feel that a major oversight was the omission of Findmypast Ireland which is offering us increasingly diverse Irish research opportunities. A word of warning too, that it’s important to read the background information to see just what records are included. Todd also referred us to the great information available on the Family Search’s Irish Wikis and the videos of expert presenters. He reminded us that we should look at the Church of Ireland records especially in relation to probate or burials as this Church had responsibility for these matters even where your ancestor was Catholic. He tantalised us with the wealth of data on the 1851 census, only for it to be destroyed –truly enough to make you weep. None of us would have brick walls if they still existed! Some lucky people may have family members who submitted a copy of this census to obtain their old age pension, but even though I had relations to whom this should apply, nary a record was found in the National Archives of Ireland when I visited. Todd suggested that you might be lucky enough to find these old age pensions through the county heritage centre– but definitely worth enquiring first, and getting a quote for price and what they can provide. I for one am off to check out the US Passport applications on Ancestry in the hope of finding some collateral lines of nieces and nephews. All in all, great presentations which provided lots of learning opportunities for the attendees…the conference delegates at Congress 2012 are in for a treat. Thanks to the Northern Territory Library and the Genealogical Society of the Northern Territory as well as Family Search. I used my ipad throughout the talks to take notes on google documents. It was also useful to follow along with some of the sites as it was easier than seeing detail of some slides. This entry was posted in Irish family history and tagged Congress 2012, Don Poffenberger, Family Search, Irish family history research, Todd Knowles, video classes, wikis by cassmob. Bookmark the permalink. Glad you enjoyed it Joan…and this was only half the day. I had nanna duties for a while but got back to hear some of the afternoon sessions. You’re welcome Angela. In this case I’m just the conduit. Catherine I found out my Mary O’Brien’s place of birth via her sister’s death certificate. Given the tendency of the Irish to travel in waves, is this sideways research possible for you? Never give up…a good motto. Good luck with the hunt Catherine…let me know how it turns out. I’m currently wrestling with one of my persistent Irish problems. Sure will Pauline. Am awaiting transcript of a Marriage which may be her sister’s with an incorrect spelling? … Many thanks for your encouragement. It means the world… cheers.